Seton offers Custom Stamped, Filled and Engraved Valve Tags in Stainless, Aluminum, Setonply, Poly and Brass. We also offer tags for valves that are Custom for Fire Sprinkler Valve ID Tags and Custom Valve Indicator Tags. Custom Valve Tags are a great option when you need a specific wording, abbreviation or numbering sequence that stock tags can't provide. 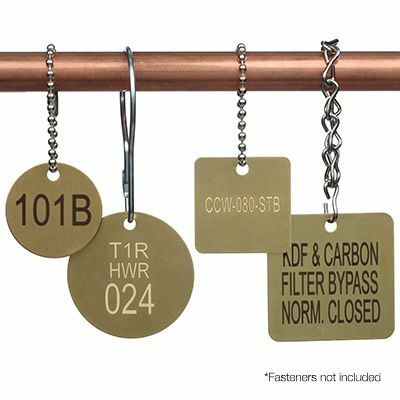 Custom Valve Tags from Seton include: Fire Sprinkler Valve ID Tags, Vinyl Valve Indicator Tags, Square Custom Stamped Brass Valve Tags, Round Custom Stamped Brass Valve Tags, Color Coded Numbered Valve Tags and more.